The master woodwright returns here with instructions for handcrafting an appealing selection of projects from the American woodworking tradition. The Woodwright's Apprentice begins with directions for building a workbench. Each successive project builds new skills for the apprentice woodworker - from frame construction to dovetailing, turning, steam-bending, and carving. Among the twenty items featured are an African chair, a telescoping music stand, a walking-stick chair, a fireplace bellows, and a revolving Windsor chair. 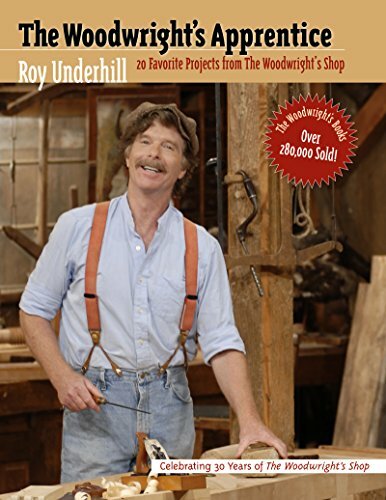 Designed both for woodworking novices and for more seasoned woodworkers looking for enjoyable projects, the book includes step-by-step directions, complete with easy-to-follow photographs and measured drawings, and an illustrated glossary of tools and terms. All of the pieces presented here are based on projects featured in past and upcoming seasons of The Woodwright's Shop television show.